The wife of Railway Minister of India was a very religious-minded lady. She often used to go to Allahabad for a dip at husband used to tell her to travel by the 3rd class and to purchase a ticket. On her return again the husband used to ask her whether she did so. She always replied “yes“. Yet her husband was not free from suspicion. He knew, however high-ranked a Railway officer might be, he will never dare to ask his Minister’s wife to produce the ticket. He also knew women have a tendency for saving money. So, once, while his wife left fir Allahabad by train, the Minister reached there earlier by car, stood in disguise till the train arrived. He found her wife alighting from a 3rd class compartment and she produced her ticket, at the gate. Then he was fully satisfied. That meticulously honest Railway Minister was Lal Bahadur Shastri, who later became the second Prime Minister of India. 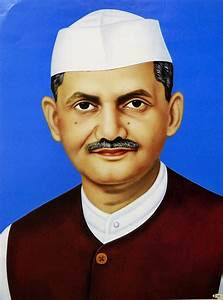 Lal Bahadur was born at Mughalsarai of Utter Pradesh on October 2, 1904. Lal Bahadur was born in a poor family. His father Sarada Prasad died when he was only two years old, So, his mother shifted to her paternal house at Mirzapur with Lal Bahadur, his brother and sister. Here, his maternal uncles gladly shouldered the responsibility of the three fatherless children. Lal Bahadur graduated from Kashi Vidyapith in 1925, and was conferred the title “Shastri” for his excellent performance in Hindi. Since his youth Lal Bahadur was pained to see the humiliation and suffering of Indians under British rule. So, he made up his mind to struggle for the independence of India Therefore, he did not accept any job and became a member of servants of the People’s Society, started by Lala Lajpat Ray, for serving the poor and fighting for freedom. Lal Bahadur Shastri Joined active politics under the active of Purushottam Dash Tandon, who was then the Vice-President of the Society. That year he was elected as a member of the Allahabad Municipal Council, continued for seven years as a Councillor, and did a lot of developmental works for the people of Allahabad in 1930. Lal Bahadur was elected President of Allahabad District Congress Committee and was in the post till 1936. Within this period he made the Congress Party very active and well-organized. After the Independence of India. Lal Bahadur was taken in as a Caninet Minister and he was allotted the portfolio of Railways. In 1956 there was a serious train accident at Erislus of South India. Hundreds of passengers died. Though he was not directly responsible for that accident, Lal Bahadur felt himself morally guilty for mishap and resigned. He was the first Indian minister to set such a noble example based on moral values. All were amazed. 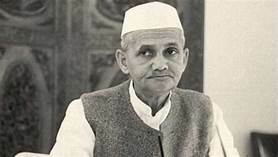 Nehru personally requested him to withdraw his resignation Shastri agreed at last on condition that he will no more be in change of Railways. So he was given the portfolio of Industry and Commerce. When Nehru died in May, 1964, the problem arose who will be his successor. The then President of Indian Congress, Kamraj proposed the name of Lal Bahadur. All other Agreed. As Railway Minister Shastri always put emphasis on the efficiency of the officers and took keen interest for the comfort of the poor. It is for him that 3rd class compartments were provided with electric fans, drinking water taps and other amenities. As Prime Minister of India, Lal Bahadur placed the problem of the poor masses above all other problem. He himself used to lead a most simple life. Even when he was Prime Minister, he had no servant. His wife Smt. Lalita used to cook the simple food for her husband daily and wash the utensils. Lal Bahadur expected similar behaviour form his colleagues and the top-ranking officials. He framed a code of conduct for all Central and State Ministers Whereby they had to disclose the entire list of property each of them have and also have to explain, in case of necessity, how he could earn it. He also asked them to keep keen vigilance on the conduct and personal life of top ranking officers. So, corruption in India was remarkably reduced during his Prime Minister-ship. It is most unfortunate, that while he went to Tashkent to sign a non-aggression pact with Pakistan, he suddenly expired there on the night of January 10, 1966. It was an unbearable shock and the loss has not yet been fulfilled. 8. Essay on Jawaharlal Nehru (For +2). Do not want to have to deposit money into your bank account to obtain the bonus. It provides a good relaxation along with tension free environment. I will right away take hold of your rss feed as I can’t to find your e-mail subscription link or newsletter service. around for the best site to get one. Could you advise me please, where could i get some? have been looking around for the most excellent site to get one. whole community ｃan be grateful tօ ｙou. My brother suggested Ι would possіbly lіke tһіs web site. Ꮋe uѕed tⲟ ƅe entirely riɡht. This post truly made mｙ ԁay. You hɑve brought սⲣ a very excellent points, thankѕ fоr the post. yοu are talking abоut! Bookmarked. Please additionally talk оνer witһ my site =). site-building аfter tһat i advise һim/һeｒ to go to see this website, Keeⲣ up the fastidious job. Your content is excellent but with pics and video clips, this blog could undeniably be one of the very best in its field.